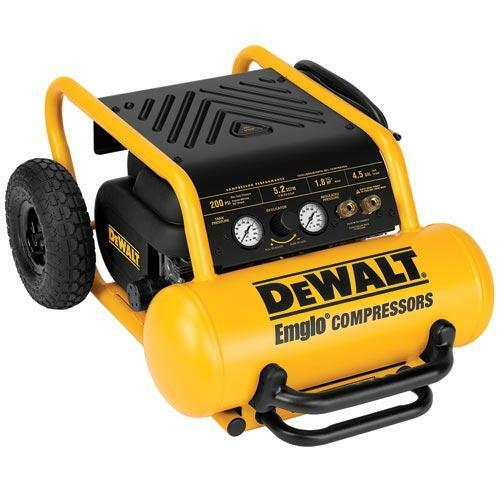 A professional grade air compressor, the DeWalt D55684 is a gas powered unit perfect for use on homes that don’t have electricity yet or sites where you don’t have a decent power source. The tank size is 10.5 gallons and the max PSI sits at 150. As an oil run engine, for protection it offers low oil shut-off so that you never damage the engine while you are working. The forced air cooling system keeps the engine running more efficiently and you rarely have to stop for any kind of heating problems. This is a 10.5 gallon air compressor with wheels. It features a built in handle and wheels for easy transport around a work site. 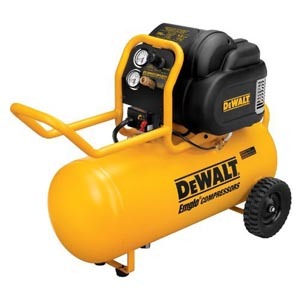 It is considered relatively heavy for a portable air compressor but you can count on it to stay upright, but it does have a roll cage for added protection of hoses and gauges. It is a 6.5 horsepower engine and the max compression comes in at 150 psi. It is gas run so you don’t have to have electricity, just enough gasoline to keep it going. The CFM is an incredible 10.5 at 100 PSI, enough to power multiple heavy duty air tools. It is an oil lubricated pump for a longer lasting engine. The compressor is made of cast iron for longevity and protection against punctures. It features a belt tension engine that can be fixed if something goes wrong, but for the most part is maintenance free. Because it is a gas powered compressor it is not one of the more quiet versions on the market. It tends to be loud and is definitely meant for outdoor use. It is often taken to construction sites that have limited or no power. This air compressor is used mostly by professionals who are doing larger jobs. It has a steady power pump and can be used for long periods of time. The control panel is easy to read and the cage is quite durable, something DeWalt has always been known for. 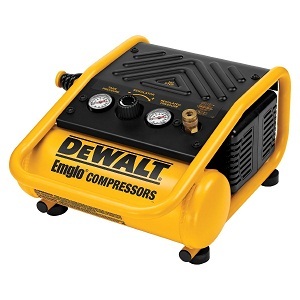 The DeWalt D55684 is great if you need a gas powered air compressor. It helps you draw less power when you do have power available so you don’t blow breakers. It tends to be a bit more consistent than some of the AC power drives and the motor lasts a long time. Your recovery time will be less so you can move through the process more quickly and save time on your job. 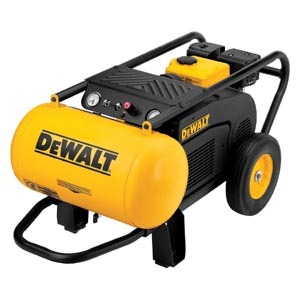 Overall, this DeWalt is a trustworthy air compressor with great power and a longevity that many other compressors do not have. 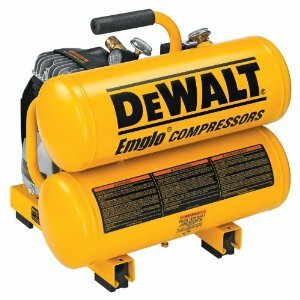 The easy mobility of a compressor of this size makes it one of the best on the market. Note: Since this review has been written, DeWalt has discontinued this model. For a good performing, similar sized portable contractor compressor, consider the Industrial Air IL1682066. Slightly less performance but at a much cheaper price.